Connie Jenkins is an accomplished Realist painter whose large-scale canvasses feature rocks, water and the natural landscape, but also contain elements that are not as easily identified. Her images often represent the push/pull interrelated forces of yin and yang. Connie’s series record cycles of the moon, tides or seasons that parallel the passage of time in the human life cycle. Her paintings deal with birth, aging, death, and ultimately, rebirth. 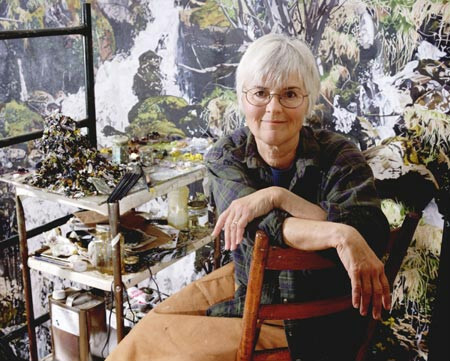 Jenkins received both her bachelor and master’s degrees in art from the University of Colorado at Boulder. Connie has shared her artistic expertise by teaching classes in drawing, painting and design for over 25 years at colleges and universities throughout Southern California. Her work is included in collections world wide. Connie Jenkins’ documentation took place in 2000. The FOTM Archive contains extensive information about this artist.